Chris from Pickup Some Creativity has been sharing tutorials on her blog for making a dolly nursery. 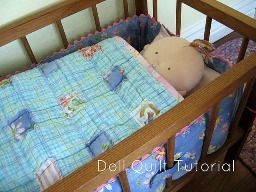 She finishes the series with a tutorial for making this sweet little baby quilt. It’s cute and quick to sew. Though it looks like it’s a patchwork quilt, there’s actually no fussy piecing involved. Go to the tutorial.